Take M-20 east through the town of Mecosta, to 9 Mile Rd. Turn right (west) on 9 Mile Rd. New Hope is located on the north (right-hand) side of the road. Take US 131 to Jefferson/Morley exit 125. Go into Morley. In Morley, Jefferson becomes Cass Street. When you reach 3rd Street (Northland Ave.) left (north). After Morley, Cass becomes Northland. Take Northland to 5 Mile Rd. and then turn right (east). Follow 5 Mile Rd. through Altona and then turn left (north) on either 80th or 70th Avenues. If you make the 80th turn, take 80th to 9 Mile Road and turn right (east). The church will be on your left. If you take 70th (a big curve), take it to 9 Mile Road and turn left (west.) The church will be on your right. Travel west on M-20 (E. High St.), and follow it for approximately 23 miles. Turn left (west) on 9 Mile Rd. New Hope is located on the north (right-hand) side of the road. Take the 8 Mile Rd exit 131 off from US131 and head east toward Stanwood away from White Cloud. Option 1 - Stay on 8 Mile and follow the St. Ive's signs to Buchanan Rd. (8 mile to 155th (turn left), follow 10 mph curve onto Buchanan). Stay on Buchanan through Canadian Lakes. At stop sign at 90th Ave. turn left (north) onto 90th. In less than a mile, turn right (east) onto 9 Mile Rd. Church is between 70th and 80th. Option 2 - After exiting 131, at the corner of Northland Ave. and 8 Mile Rd. turn south (right) and take Northland into Stanwood. Watch for "Truck Route" signage and turn left (east) at Jefferson St E. Immediately turn right (south) at Front Street and follow Front Street to Pierce Road where you can only turn left (east.) Once you do, follow Pierce Rd. all the way into Canadian Lakes. Pierce Rd. will become 100th Ave as you follow a big curve. At the corner of 100th and Buchanan Roads turn right (east), At stop sign at 90th Ave. turn left (north) onto 90th. In less than a mile, turn right (east) onto 9 Mile Rd. Church is between 70th and 80th. Driving Apps do not always calculate our location well, so please follow these instructions first. During the winter season, the roads are cared for in different ways by different municipalities, so please add extra time. Double check that you have New Hope United Methodist Church and not New Life, which is in Lakeview. 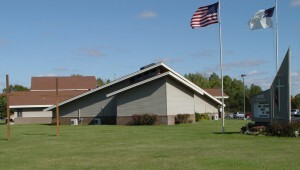 We often get confused with the good folks at New Life UMC down on M46.